My blog is 5 years old today! I wrote the first entry on the 26th of September 2005, 2 days after I arrived in Norwich. Can’t believe that’s 5 years ago! It started out as just a simple blog to tell my family and friends back home what I had been up to, but it grew into a lot more. I got more serious about photography, and my blog was the perfect way to share that. I gained a few readers when I moved to Norway, as this is a dream for many people. It’s been really nice meeting people through my blog 🙂 I get questions sometimes from people about to visit Tromsø, which I love to answer – and that sometimes resulted in meeting them in person, which is great fun! As I can’t post without photos, here’s a photo I took a couple of weeks ago. 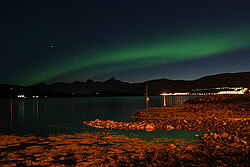 It was taken on the evening my brother and his girlfriend arrived in Tromsø in early September. I drove to the airport to pick them up, but as I knew the northern lights were active, I left early and took my camera and tripod. I stopped next to the road to take some photos. The lights weren’t very strong, but I love the mood of this photo – and the “Tromsø skyline” that has become so familiar to me. 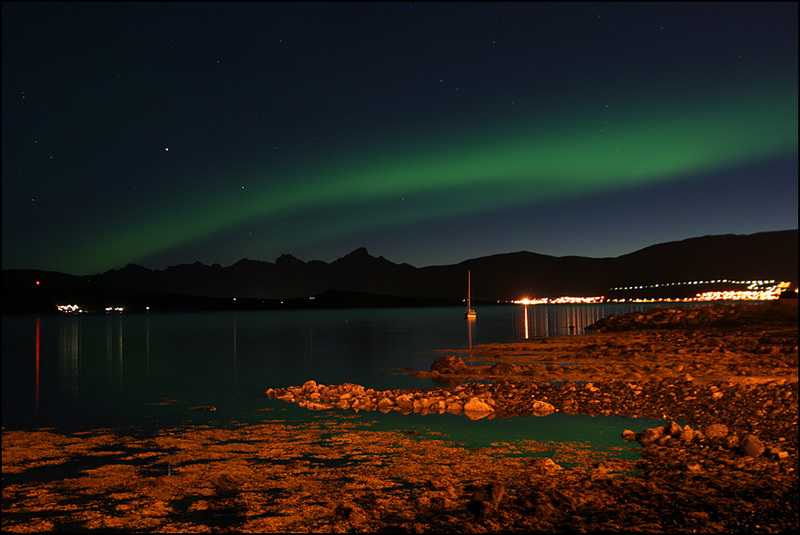 If you know the area, you can recognise Håkøya (an island, with the red light on top), Store Blåmann (the “Matterhorn” of Tromsø), the sailing boat that never seems to move and the lysløpe (litt ski/walking trail) on Kvaløya. Happy Birthay Traveling Fire Hair Maiden! I can’t believe I have known you that long and more. Ours has been a fantastic virtual journey. I can’t believe it! Someday you will come to the USA and I will get to meet you personally. Until then I will keep reading your postings and emails which always bring me so muy pleasure and joy. Keep it up! Hello Martha! Yeah how time flies… we’ve been in touch for 6 years now! I’ll write you soon, and we should sort skype out 🙂 I am planning a trip to the USA for next summer actually, as Nicole is getting married in Seattle. Not sure how long I’ll be able to get time off work, but I’ll definitely let you know if Las Vegas is an option!